Stock and bond markets have been roiled by concerns about trade tensions and the economy. 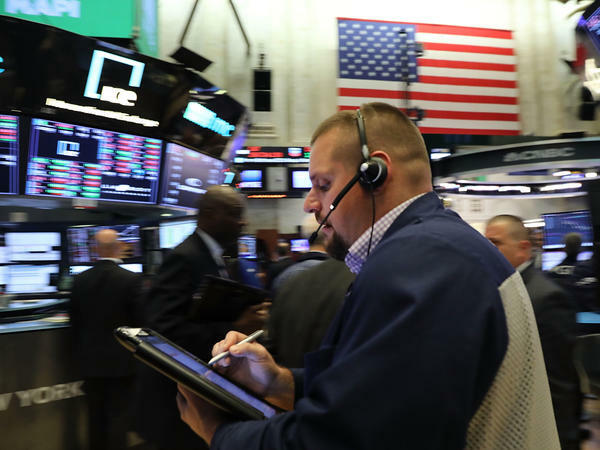 Stock prices tumbled Tuesday amid investor fears about trade, wiping out the gains that followed the Trump administration's decision to delay higher tariffs on imports from China. The Dow Jones Industrial Average dropped 799 points, losing 3.1 percent of its value, while the S&P 500 index fell 3.2 percent. The Nasdaq composite index plunged 3.8 percent. In another worrisome sign for the economy, the interest rate on short-term U.S. Treasury securities actually rose above that of longer-term instruments. The unusual phenomenon is known as an inversion of the yield curve, something that hasn't occurred since 2007. It often signals a slowing of growth and perhaps even a recession, economists believe. "What investors are worried about is the near-term economy. They're worried that something pretty serious is going to go wrong within the next, say, six to 12 months, and that's going to tip the economy into recession," says Jared Bernstein, a senior fellow at the Center on Budget and Policy Priorities. Markets in Asia later followed Wall Street's lead. Hong Kong's Hang Seng index dropped 1.6 percent Wednesday, while Japan's benchmark Nikkei index slipped 0.5 percent. Meanwhile in China, where tariff negotiations with the U.S. are also being watched closely, the Shanghai composite index closed down 0.6 percent, recovering from a steeper drop at the open. Stocks in the U.S. have been unusually volatile since the beginning of October, especially once-surefire technology shares. Major market indexes are barely up for the year. The decline has been especially big for companies such as Boeing, down nearly 5 percent Tuesday, and Caterpillar, which lost nearly 7 percent, that export heavily and stand to be hurt by the China-U.S. tariff war. Over the weekend, Trump agreed not to raise tariffs on Chinese imports for 90 days, to give the two countries time to resolve their differences. That sent stocks higher on Monday. But with time, investors appeared to reassess their views of the market on Tuesday, sending stock prices and bond yields lower. Normally, investors want more money to invest in long-term bonds, because they're agreeing to lock up their money for a greater period. That's why interest rates on, say, five-year notes tend to be higher than those on two-year notes, and 10-year notes tend to pay even more than that. But late on Monday, the reverse happened: Five-year notes paid less than three-year notes, an indication that bond investors aren't too sure what the next few months will bring. Bernstein, a former White House economist, notes that investors are worried about several factors. "They don't like the fact that global growth is clearly slowing. The price of oil is really in bear territory. It's fallen a great deal over the past few months. The Federal Reserve is kind of tapping the growth brakes. They're not hitting them too hard, but it does slow the economy down," Bernstein says. At the same time, the one-time stimulus provided by last year's tax cuts is likely to fade in 2019, Bernstein notes. Then there's the tariff war between China and the United States, which threatens to upend trade relations between the world's two largest economies. The big sell-off on Tuesday may have also been a kind of rush for the exits by investors. The financial markets are closed Wednesday, a day of mourning for President George H.W. Bush.